This beautiful purse from Radley is a charming piece. 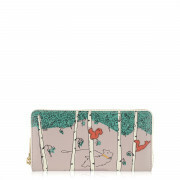 Printed with a beautiful scene of Radley in the woods, this purse is embellished with forest elements. This leather zip purse offers plenty of space for your money and has 12 card slots.